Nothing attracts friends and family to visit like moving to the country. Don’t get me wrong, Cowboy and I love our friends and family but we have done more entertaining in the last three years than the last 12 years combined. My theory is that the smell of fresh air, the promise of a porch sitting evening, and just plain old peace and quiet is as enticing for folks as honey is to flies. 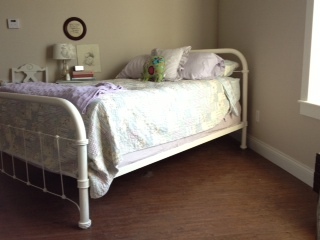 Our shabby chic guest room. Perfect for curling up in the picture window with a good book and a cup of tea. Since moving into the barndiminium, we’ve had friends and family sleep on the sofa, the floor, and on chairs and ottomans. They showed up, and we found places to stack them. We’ve hosted dinners and cookouts and packed 12+ people into our little living space. So much so, that last summer Cowboy built a guest suite upstairs. And thank goodness Cowboy is handy, or we’d still be spreading pillows and blankets out on the floor. Our move to the country even inspired both sets of our parents to follow suit. My parents came just 11 months after we moved, and Cowboy’s parents just two months ago. And let me just say that they are all hooked. We’ve got dads driving tractors and feeding horses, and moms enjoying porch time and deer watching. City Girl even has dibs on the barndiminium apartment for her retirement digs. We’ve seen friends and family that we haven’t seen in years, and all because it’s enticing to take the long drive out of the city and head to the rolling hills, wildflowers, and calm. And, I’m guessing you need this allure to attract visitors when your most interesting personal skill is that you can scoop a darn clean horse stall or make a mean enchilada dinner (obviously not at the same time, and with much hand washing in between). I digress … so if you want to see your family more often, become the vacation destination. Oh, and it helps if you have a small zoo at your disposal as well. Nothing will attract the kiddos like the allure of petting a donkey, riding a horse, or chasing around the barn cats. The bottom line, it’s a good thing to have an interesting place to hang your hat since otherwise we’d still be looking at a pretty but empty guest room. And if you need a break from your family, settle down in the suburbs. 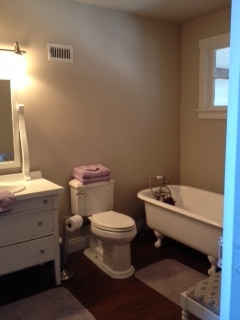 The guest bath – complete with a vintage claw foot tub. Time for a soak! As I mentioned in my last post, things around the farm have been busy. One of those “things” that is keeping us so darn busy these days is a our latest addition, a new cocker spaniel puppy that I named Maybelle, or as Cowboy likes to call her, Squirt. We needed a puppy like you need a heater on a hot Texas summer day in August. That is to say, it’s completely not necessary and may just send you past the breaking point. The truth is we were thinking that we would just let the doggy population here at Wild Horse Valley naturally shrink over time. But my heart is often bigger than my brain, and so it goes that Maybelle is smack dab in the middle of it all. You see, when I graduated from college I used my graduation money to buy the sweetest little blonde cocker spaniel named Madison. We had that crazy girl for 13 years, and while we loved her to pieces, Cowboy said absolutely no more cocker spaniels. While they rank high on the adorable scale they rate in the stratosphere on the high maintenance scale. Madison costs us thousands of dollars with ear issues, eye issues, and just plain issues, but we loved her just the same. Back in August of 2011, we lost our sweet Madison due to complications of old age. That was a terribly hard day filled with tears from both Cowboy and me. It’s never easy saying goodbye to a dear friend, but somehow they gently tell you when it’s time, and you muster all the strength and courage you have in your body to do what is best for them. I reached down into the fur pile and pulled out Maybelle. The littlest one, red in color, and one of only two little girls. I could see Cowboy cringe and start to step away as I heard him very clearly say, “No!” But memories of my sweet Madison kicked in as Maybelle cuddled up to my chin and I was done for. Because they had no papers, they were very reasonable, and I happened to have just enough cash. Sold! Then puppydom kicked into full gear. I think the brain has some sort of protective mechanism, because if we had ever remembered how much pure work a puppy is, well let’s just say we’d still just have three dogs. Holy smokes … potty training, crying in the middle of the night, chewing (oh the chewing). If for one minute I was even thinking that two-legged children might be nice, puppydom knocked it out of me in two seconds flat. Puppydom has given me a whole new respect for my mommy friends. The new favorite word at our house is “no,” as in “No, don’t eat that, ” or “No, leave the cats alone,” or “No, you really have to go outside again?” It’s 1/10 humor with 9/10 persistence and a whole bunch of puppy kisses, because let’s face it, who doesn’t love puppy breath? Quite frankly, it’s a good thing puppies are cute, because otherwise … well let’s just leave it at that! The good news is that I really think Maybelle needed to come live on a farm. She is absolutely fascinated with the horses. She’ll sit in our front yard and just watch the horses in sheer fascination. If you hold her up to our big fellow, Smokey, she’ll put her floppy paw on his big nose and cover him in puppy kisses. She loves nothing more than to be outside chasing butterflies, stalking grasshoppers, and tormenting my garden. But she is our Squirt, and we adore her! 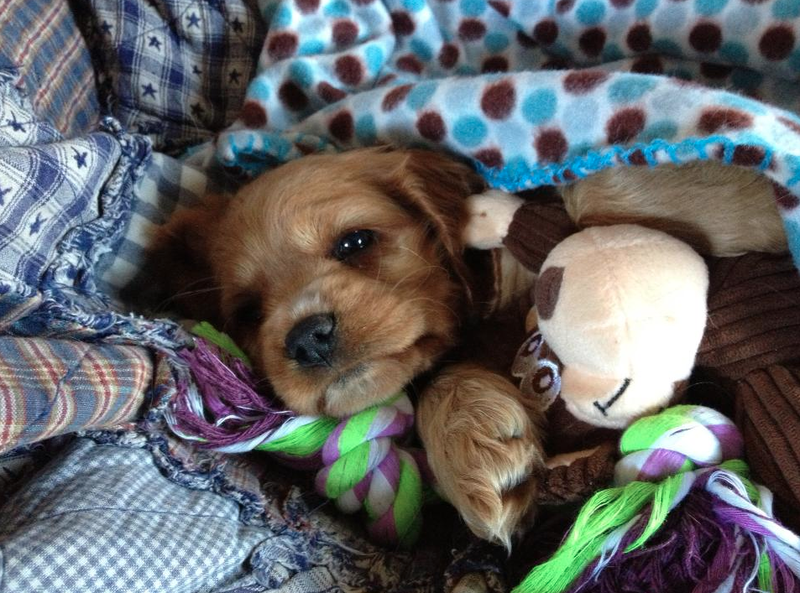 Maybelle on her first day home – already spoiled with love and toys. Cowboy’s got photos of me passed out on the couch with a worn out Maybelle on my chest, both of us exhausted from puppydom, but someday I’ll look back and smile at those moments as my dear old Maybelle sits in my lap content to just be petted. How long do you think I’ll have to wait for that? There is a saying I love that goes, “Behind every successful rancher is a wife who works in town.” Well it should be amended to say, “Behind every family who lives the country life, someone is working a day job or two in the city.” All that to say, Cowboy and I have been busy around here with our day jobs, but trust me the farm antics are still in full force. Please accept my apologies, as I’ve sorely neglected my blog. I have so appreciated all of the wonderful feedback and support for our stories. I’ve done a little reworking of the blog tonight to take better advantage of the categories feature . My plan is to continue to write the short stories, but mix it up with farmtastic tips (things I’ve learned the hard way or just plain ole fun stuff), farmtastic cooking (recipes I love), farmtastic gardening (fun thoughts on ways to make your garden sparkle). So make sure to use the categories on the right hand side if there is something you are particularly passionate about. Hopefully you will enjoy the variety and keep reading, as I sure do appreciate you! Oh, and just for fun I’ve added a new Meet the Farm page, where I’ll keep a photo gallery of all the critters who call Wild Horse Valley home. God bless and thanks for stopping by!